Located two miles from James Madison University in the Shenandoah Valley, Fairfield Inn & Suites by Marriott Harrisonburg makes travel effortless. 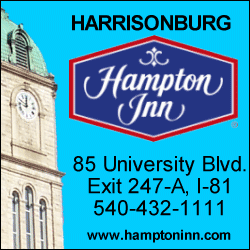 Our hotel in Harrisonburg is minutes from Rockingham Memorial Hospital, Blue Ridge Mountains, Skyline Drive. Just a mile from our Hampton Inn® hotel, you'll find James Madison University's lovely campus, making the Hampton Inn hotel the perfect headquarters for graduation, registration for classes or just a visit to the colleges in our area. Consider the Country Inn & Suites your home away from home! As you venture out to rediscover the historic attractions in Lexington. You're close to VMI, W&L and the Virginia Horse Center. Also nearby are the Blue Ridge Mountains and the Natural Bridge of Virginia. Conveniently located near popular local attractions including - Washington And Lee University 6 mi., VMI 6 mi., And Virginia Horse Center 4 mi.on-site Muchacho Alegre Mexican Restaurant Bar & Grill. A Cozy Stay At A Comfortable Price®. Free hot breakfast, heated Indoor pool & spa. Restaurants and shopping nearby. In-room fridge & microwave, coffee Maker & Hair Dryer. Celebration Whirlpool suites guest laundry facility. Exercise room and business center. The new Sleep Inn and Suites is a 3-diamond AAA rated hotel that features deluxe continental breakfast, free high speed internet access, an exercise room, indoor heated pool and hot tub. All of our rooms have microwaves, refrigerators, coffee makers, irons and ironing boards. Located off I-81, Exit 191 to I-64 Exit 55. Virginia Horse Center is just one mile. W&L and VMI are 5 miles. The property amenities include free high speed wireless internet, HBO, super start breakfast and hairdryers in all rooms. Waffle House Restaurant on property. Free high speed internet. The Mimslyn Inn, Circa 31, is a luxury full service hotel with 45 rooms, two restaurants and almost 5000 square feet of meeting space. Conveniently located to the major attractions in the area and within walking distance of historic downtown Luray. Easy Access to Natural Bridge, Lexington and Blue Ridge Pkwy. Newly renovated rooms, non-smoking rooms. Adjacent to Pink Cadillac Diner. Free HBO & satellite TV, micro/fridge available. Senior, AARP and group discounts. Free High Speed Internet. Close to Natural Bridge, Lexington and Blue Ridge Parkway. Spectacular views, clean, comfortable rooms, micro/fridge available, free HBO & satellite TV, non-smoking rooms. Stay at the Comfort Inn and Suites® in Raphine, VA, located off I-81 in the Shenandoah Valley. Newly renovated hotel between Lexington and Staunton. Pet-friendly. With an indoor heated pool, 92 rooms and wireless Internet, the Hampton Inn/Woodstock is the newest, most exclusive hotel in the Shenandoah Valley. Located in the quaint, historic town of Woodstock, and is central to many of the Valley's breathtaking and unique attractions.